.I’m Jan – 54 years old – retired for 4 years. My partner Ian is 42 and still working (bless him). Pepper the dog is a blue merle border collie with two ice blue eyes – everyone falls for him. He’s 14 now and having recovered from a stroke last year – still acting like a puppy at times. With Dad in the army, I had grown up moving around every 3 years or so and this continued into my adult life – becoming restless after being in one spot for a couple of years. Both Ian and I had lived in caravans in a former life and when we got together we first lived in a flat then a larger house with garden. 5 years of the house and complete renovation, we decided a life afloat would be for us. At that time I was in a very stressful job and life afloat gave me the opportunity to turn my back on that as we would be able to survive on one salary. 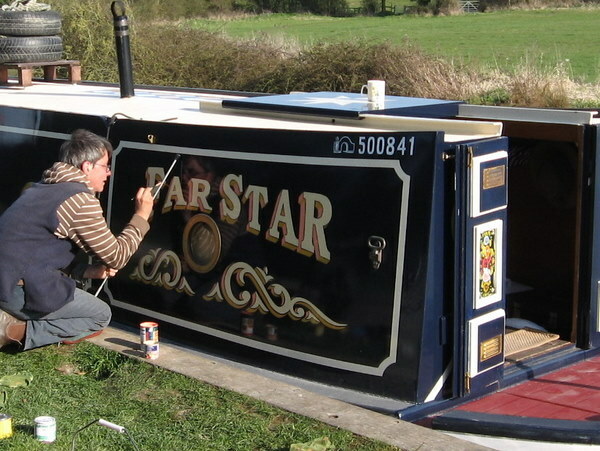 Our boat is Far Star – she’s 14 years old, so was already named when we got her. We have no intention to change her name – it is said to be bad luck, but Far Star suits us anyhow. She is a 70 foot long trad narrow. We have had Far Star for 5 years now. We were very lucky to sell our house at the top end of the market. Having worked so hard on the renovation, we cleared the mortgage and bought Far Star outright, with a little left over for a rainy day fund! How much time do you spend working on your boat each year? We have spent a few thousand on her in the 5 years. Difficult to say how much each year, but it would run into high hundreds even thousands. Having retired from my stressful administration position, I now spend my days painting canal artwork – small projects of household goods, including Buckby cans. From spring to early winter I also work as a part time jobbing gardener – tending gardens for folk who can no longer manage it. It is very satisfying work, but would not make me a living. I am very lucky that with Ian working, I am able to do this. I guess one of the biggest moans of ours – and that of many others – is the amount of dog mess on the towpath. Arriving somewhere new and putting the ropes out, only to find that either your foot or the rope have landed in a lump of smelliness is very frustrating. Especially having a dog of our own and knowing how few dog dump bins there are on the towpatch – but we always manage to take our ‘family’ mess home with us to dispose of. Tranquility – that’s it in a word. There is of course, the wonderful community – I’ve never lived anywhere where folk are so helpful and friendly – we very soon felt part of it, whilst also maintaining our privacy and peace and quiet. There is always maintenance to be done, and odd little changes along the way, but I don’t think there are any major changes that I would make. Make canalside purchases where possible – people often sell their own eggs, veggies etc. Buckets of apples often for free etc. Pubs are a great source of information for local purchases. But shanksies pony is the ultimate answer. After all, how can you beat a stroll in the countryside with your dog – come rain or shine? Ah! We have no washing machine, so I search out local launderettes. Failing that, it just piles up. Connect 3 dongle – usually a satisfactory connection, although some spots will require me to sit out in the cratch for anything like a decent signal. (not having an extra long cable that will reach through the mushrooms onto the roof. K & A is our only experience. With Ian still working, it has not been possible to go further afield – yet. Favourite area here is Bishops Cannings – but don’t tell anyone – it’s so quiet. Power is generated by the engine, inbuilt genny and solar. Depends where we are and what kind of day it is on which source creates the power. How much do we use – again, depends what we are doing. 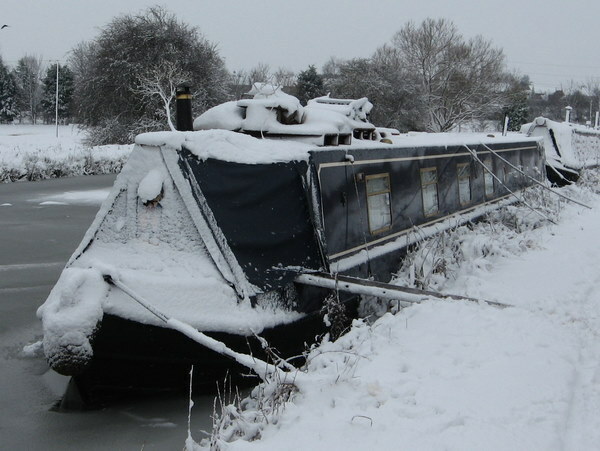 We don’t have a great deal of mod cons – no washing machine, freezer etc. We do have a 12 volt fridge, 6 volt radio and 12 volt tele, so power consumption is quite low. Nevertheless, we still run out of power occasionally. But, there is always bed with a book! .We do keep fairly snug with the fire going 24/7 and central heating to back that up if necessary. We generally put a hot water bottle in the bed before retiring, to warm things up a bit. The last 4 years have been pretty bad – minus 16C sometimes with thick ice on the inside of the windows. Nothing that another jumper and pair of socks and fluffy slippers wouldn’t solve. What obvious qustions are missing from this list? There is a kind of boaty obsession with toilets – do you have pump out or cassette? Actually, we have both. After getting frozen in for weeks on end during our first winter, we pretty soon discovered that a pump out is no good when you can’t move. So a cassette proved the best option, most of the time – although even the Elsan units can freeze over sometimes. We now use the cassette all year round and keep the ‘proper’ (pump out) toilet for guests only. This means less pump outs, saving money.